Saudi Arabia has told its citizens in Lebanon to leave the country immediately. It has also urged Saudis not to travel there. Tensions between the two countries have risen since Lebanon's Saudi-backed PM Saad Hariri resigned on Saturday, saying he feared for his life. Saudi Arabia has also accused the Iranian-backed Lebanese militant group Hezbollah of firing a missile at it from Yemen shortly afterwards. Many Lebanese fear that their country is becoming embroiled in a wider conflict between Saudi Arabia, a major Sunni power, and Shia-led Iran, its biggest regional rival. In Lebanon, various political factions have called for the return of Mr Hariri, whom many believe was pressured into quitting by the Saudis. He has made no further statement so far, but his office says he has been having meetings with foreign diplomats in Riyadh. Meanwhile French President Emmanuel Macron, who is currently on a Middle East trip, has arrived in Saudi Arabia on a visit unexpectedly announced hours before. He said he would discuss Lebanon and Yemen with Saudi Crown Prince Mohammed bin Salman, adding that he had been in informal contact with Mr Hariri. Saudi official media quoted a foreign ministry source as saying: "Due to the situation in the Republic of Lebanon, the kingdom asks its nationals visiting or living in Lebanon to leave as soon as possible, and advises its citizens not to travel there." 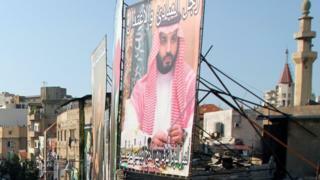 BBC Arab affairs editor Sebastian Usher says the Saudi call will fuel further tension in Lebanon where concern over Mr Hariri's circumstances has been growing. Hours later Saudi Arabia's neighbouring Gulf state and ally Kuwait issued a similar statement. Mr Hariri said in a TV broadcast from Saudi Arabia on Saturday that he was stepping down because of an alleged assassination plot. In the video statement, Mr Hariri also attacked Hezbollah, which is politically and militarily powerful in Lebanon, and Iran. Mr Hariri's father and former prime minister Rafik was killed by a bomb in 2005 in an attack widely blamed on Hezbollah. On Monday Saudi Arabia accused Hezbollah of launching a missile from Yemen which was intercepted near the Saudi capital Riyadh, CNN reported. A day later Crown Prince Mohammed bin Salman accused Iran of "direct military aggression" by supplying missiles to Houthi rebels in Yemen. Iran has dismissed the Saudi allegations as "false and dangerous". Hezbollah accused the Saudis of orchestrating Mr Hariri's resignation.